Never be caught without a bottle of Wizard Water©. I once imprudently left a game of cards early, intending to take a brisk walk to the next town. I thought the town was a mere five miles away, but it turned out to be 20 miles. I discovered this after the first 11 miles. After several hours I was so tired I couldn’t see my feet. I tripped on a rock, fell forward into a ravine, and rolled into the Brazos River. I lost consciousness. The river carried my senseless body downstream. I awoke roughly 240 miles later on a sandbar near Waco, missing one boot, all my cash, and my hat. The week previous, I’d paid for a shipment of Wizard Water to arrive at the Waco train station. Once I realized where I was, I went to the station and picked up my goods. I sold them over the next week. Thereafter I never gambled away my last bottle of Wizard Water. Nor should you. A minister came up to me after my last show and said, "You tell some fine tales, my dear boy, but they are utterly without moral compass." "What do you mean?" I asked him. "I mean, son, that they lack any redeeming morality; they do not benefit the listener's soul. When you hear a sermon, you hear something of an improving nature. Other types of storytelling such as yours are merely for entertainment or to serve the vanity of the teller; they hold no true value." "I'm not sure I agree with that, Reverend," I replied. "I've known too many preachers who put their parishioners to sleep with their long moral stories. Where is the value of that?" "What the mind comprehendeth not, the heart knoweth," he replied. "A good parable is always more uplifting than a barroom anecdote, even if it is not easily understood." "Son, don't you know what a parable is?" "Oh yes! "I cried. "A pair a' bulls is twice as many as one bull. Unless you throw in a camel - then it's more." That was the last I saw of the preacher. He stared hard at me and then walked away. I believe there is a moral to this story, but danged if I know what it is. Bleb is in love. It will never work out. He's a mule and she's a young filly from a Kentucky racing family. He won't give up, though. Now he's trying to impress her with his singing. I've warned him that such an approach won't work. "Congress is the only place where extemporaneous poetics are attempted these days" I said, "And it's not pretty. They call it a 'filibuster,' because it goes on and on and on until the newspapermen have to leave to feed their horses." That got him to stop. Bleb hee-haws well, but our senator does it better. Never compete with a professional. What a great Mountain Music and Medicine Show last night! I don't know if it was my Wizard Water©, or the full moon, or a combination of the two -- and perhaps the spring air as well -- but the musicians outdid themselves. 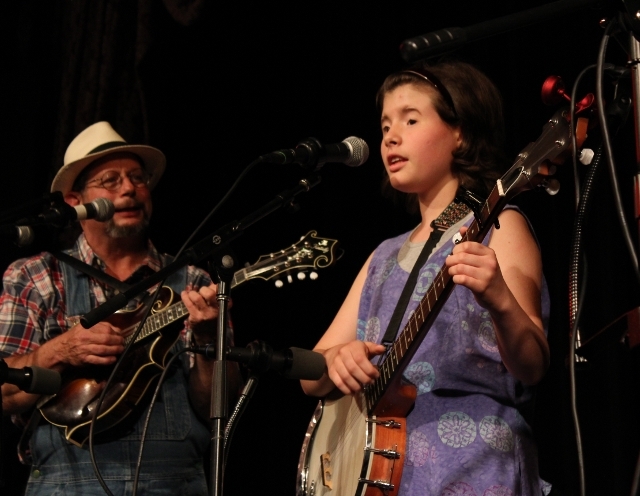 The performance standard was set high at the start by a very talented young girl named Hannah From, who played banjo accompanied by the Buzzard Mountain Boys, sang acapella (that's all by herself, for those of you who don't speak Norwegian), and told a tale about a young man's attempts to win the hand of his true love. Her vivid description of his trials and final success held the audience enthralled (that's captive, for those of you who don't speak Algonquin). 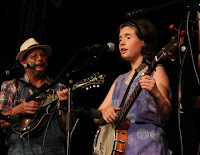 Bluegrass Alliance rattled the walls (in a good way), Elise Witt and Friends charmed everyone with their musicianship and great harmonies, and the Hobohemians stepped off a freight train long enough to play a few sets of lively dance tunes. The only mishaps occurred when Witt's friend Jason Kenney's strings caught fire due to his fast playing, and later when Hobohemian John Amoss's accordian was set a-fire by someone who thought it was a fancy set of bellows and wanted to see how good it was at putting out flames. Otherwise it was a very good night.